English pure mathematician who made leading contributions in analysis and number theory. The Greeks were the first mathematicians who are still ‘real’ to us to-day. Oriental mathematics may be an interesting curiosity, but Greek mathematics is the real thing. The Greeks first spoke a language which modern mathematicians can understand; as Littlewood said to me once, they are not clever schoolboys or ‘scholarship candidates,’ but ‘Fellows of another college ’. So Greek mathematics is ‘permanent,’ more permanent even than Greek literature. 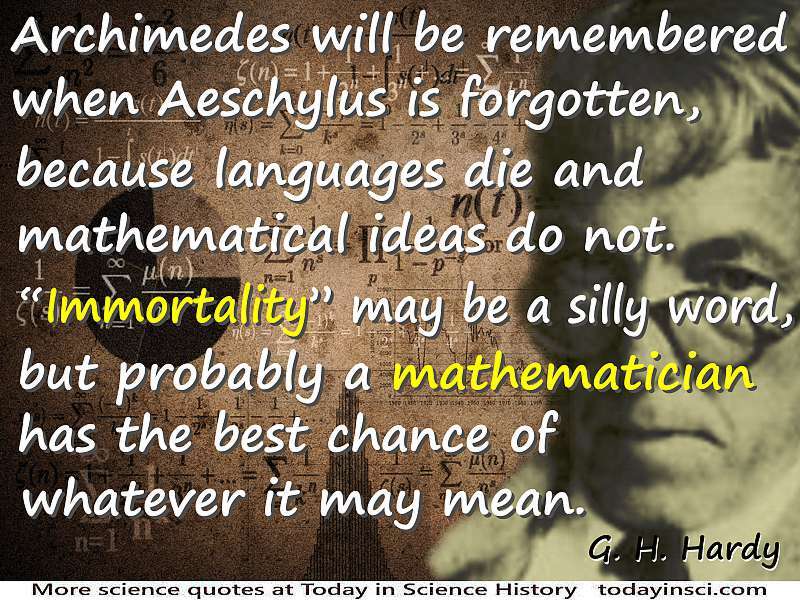 Archimedes will be remembered when Aeschylus is forgotten, because languages die and mathematical ideas do not. “Immortality” may be a silly word, but probably a mathematician has the best chance of whatever it may mean. Nor need he fear very seriously that the future will be unjust to him. Immortality is often ridiculous or cruel: few of us would have chosen to be Og or Ananias or Gallio. Even in mathematics, history sometimes plays strange tricks; Rolle figures in the text-books of elementary calculus as if he had been a mathematician like Newton; Farey is immortal because he failed to understand a theorem which Haros had proved perfectly fourteen years before; the names of five worthy Norwegians still stand in Abel’s Life, just for one act of conscientious imbecility, dutifully performed at the expense of their country’s greatest man. But on the whole the history of science is fair, and this is particularly true in mathematics. No other subject has such clear-cut or unanimously accepted standards, and the men who are remembered are almost always the men who merit it. Science Quotes by G. H. Hardy. 7 Feb - short biography, births, deaths and events on date of Hardy's birth. A Mathematician's Apology, by G. H. Hardy. - book suggestion.